The $25.5 million complex is part of the college's Waterville revitalization. 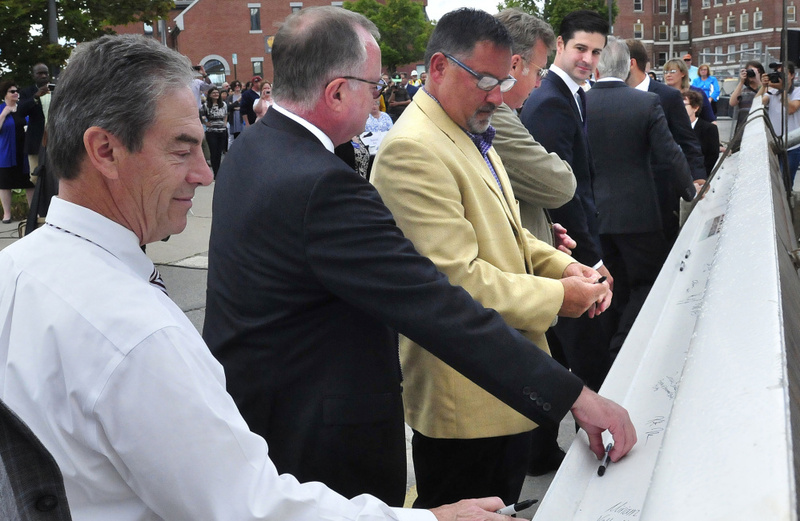 WATERVILLE — As the final steel beam was raised onto what will be a Colby College dormitory at 150 Main St., more than 100 residents, city officials and college staff members cheered. 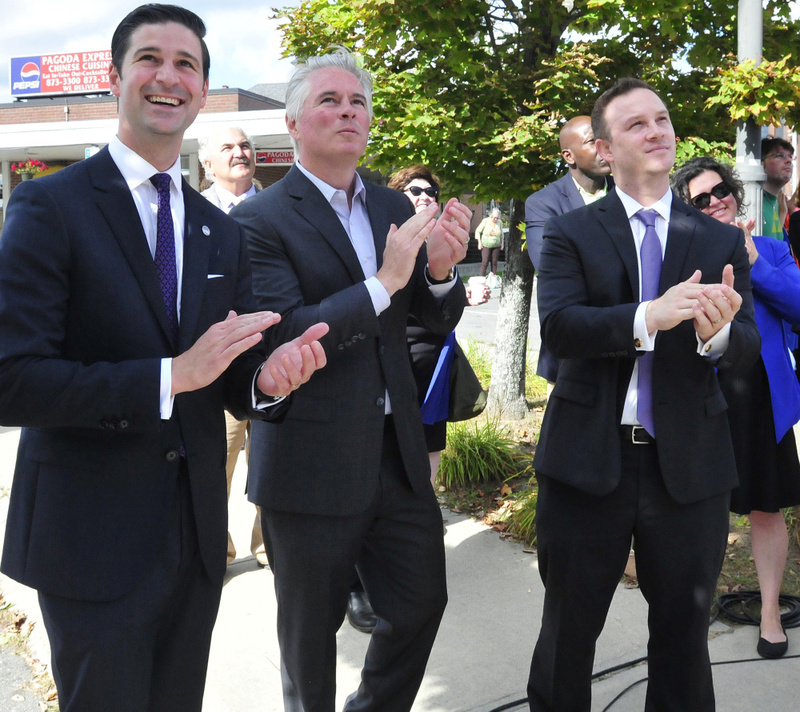 “We stand here today at not the end of something, but at the beginning of an incredible effort to revitalize the city of Waterville,” Mayor Nick Isgro said. The $25.5 million residential complex is one of a number of multimillion-dollar projects spearheaded by the college to push forward the renewal of the city’s downtown. Construction of the 100,000-square-foot building, which will house 200 students and eight faculty and staff members, is ahead of schedule; and the building is expected to open in August 2018, according to Colby President David Greene. “It’s coming to life,” he said. The complex, located on the northeast tip of The Concourse, will include retail and community spaces. The building is part of Colby’s plan to break down the “town and gown” divide and encourage civic engagement among students, Greene said. The college will work with agencies throughout the city to provide civic engagement opportunities for students, he said, and Colby staff will monitor the program to make sure it works for both partners. He expects student involvement in the program will be high, as evidenced by participation in programs such as Colby Cares About Kids, which has paired more than 500 college students with area children for mentoring. Chandler Smith, a 22-year-old senior at the college, said the residential complex presents an invaluable opportunity for students to learn independence. Smith of Yarmouth spoke to the crowd about a time when the Colby and Waterville communities came together in civil action. In April, more than 100 residents and students rallied against the Ku Klux Klan at City Hall after fliers advertising a Klan-branded “neighborhood watch” appeared on doorsteps and lawns. “This is an opportunity to continue to stand together,” said Smith, who is an independent major studying social justice. Smith has been a mentor in Colby Cares About Kids for a boy named Kaulen, and it was the “most powerful part of my life these past three years,” he said. Greene also spoke about the importance of the Hains building, one of five vacant buildings the college bought in 2015 as part of its revitalization effort. The building at 173 Main St. officially opened Thursday, but it started housing Colby College staff members in August. 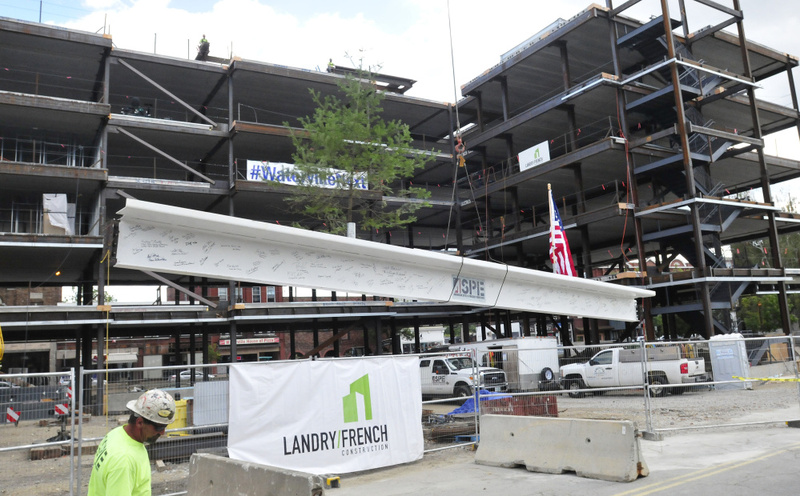 The staff from CGI, a software consulting group, is expected to move in soon. “For it to once again have a new life … that, to me, is a really heartwarming part of rethinking Main Street,” Greene said.